Spa-Tea-Da! 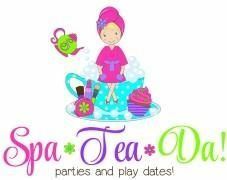 Is a special party boutique and day spa in West Mobile specializing in fabulous theme tea birthday parties for children ages 3-13. Creative and whimsical parties that create lasting memories for you and your guests are just a phone call away! Frozen, Princess, American Girl, Spa, Fashion show, Mermaid, paint your own pottery and more! We are happy to work with you to make your daughters party dreams come true with our custom theme service. Our parties are designed with Mom in mind...we want you to relax and enjoy your daughter's special day. Visit with friends and family or better yet join in the fun! while we handle every detail of your party! Our private party suite is approx.1,000 sq feet for your comfort and beautifully decorated in our signature fabby chic style! Our packages are affordable and upgrades such as our sweet party favor buffet and magical princess visits are available. MAGICAL would best sum up the Spa Tea Da experience! We have attended two tea parties-Frozen and Cinderella. When we arrived for the Frozen tea party, we were greeted at the door by Anna and Elsa. Every room was immaculately clean and exquisite. If you love sparkle, bling, and glam, Spa Tea Da would be your paradise. Anna and Elsa did not just sit around and look pretty-they danced, sang, and tossed snowballs with the girls. They also polished the girls' nails and put dazzling make up on them. The make up was applied with a cotton swab and not dipped into the make up after it had been used. After all of the fun, the little princesses were led to the tea party room. The table and room were decorated for royalty. The girls ate fancy cupcakes, cookies, sipped lemonade, and chatted with Elsa and Anna. Cinderella was an elegant hostess and made my sweet girl feel like a princess. Anna, Elsa, Cinderella, and the tea parties they hosted were enchanting. Ms. Carolyn is a queen for opening such a special place! I believe her vision was to have a place for girls to feel as special as they truly are. Thank you for opening your door and providing my princess with two fantastic days of fun!